My new treble booster pedal sounds sweet! 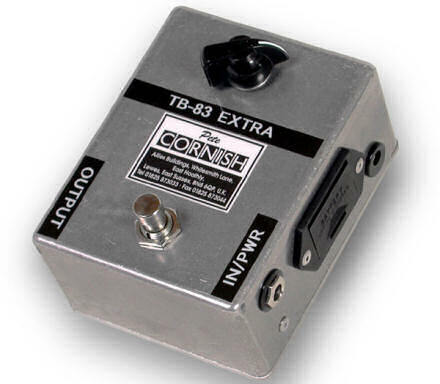 Pete Cornish TB-83 Treble Boost guitar pedal. Sadly I don’t have one of these, though. For as long as I can remember, I’ve loved Brian May’s guitar tone. That unique combination of his fingers, his homemade guitar (the Red May Special, famously built by Brian and his dad Harold out of amongst other things an old oak fireplace and a blackboard), a wall of legendary Vox AC30 amplifiers, an old English sixpence as a pick, and a treble booster (TB) pedal. While I have a TB built into the Vox Brian May Special (‘Deackie’) amp during the last season of Powerpoint (a monthly Christian youth event in Edinburgh) for some reason beyond my current understanding I was getting an earth loop-related buzz from the Vox TB. I wondered if using a separate, non-mains pedal might solve the problem. However, the only problem there is that treble booster pedals are generally rather expensive. BOSS (who manufacture a fine range of very reasonably-priced and top-quality guitar effects pedals) don’t make one, and the best ones are hand-built by guitar effects gurus like Pete Cornish and Greg Fryer. The TB-83 from Pete Cornish, for example, costs £190.55, the TB-83 Extra (pictured above) weighs-in at £242.66; the Greg Fryer versions are comparable. 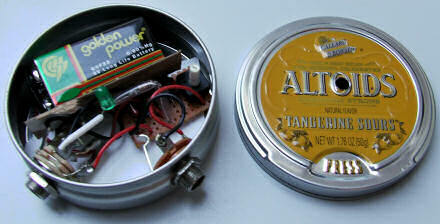 My new handmade treble booster built into an Altoids tin. From the outside it looks much like any other Altoids Tangerine Sours tin, except that on the side there are two 1/4″ jack inputs, and the ‘O’ in ‘ALTOIDS’ now has a small green LED poking through the tin lid. There is no on/off switch, as such. This works like many other stomp boxes, including my Zoom 504II (acoustic pedal): it is powered on when a cable is plugged into it, and off where there is not. Quite simple, really. Opening up the tin reveals the back-ends of the jack inputs, a small tangle of wires and a collection of resistors, capacitors, diodes and a potentiometer neatly affixed to a board. The electronics are insulated from the base of the tin by some cunningly placed white stickers, and the 9V battery is separated by a thin length of card. It’s a genius idea, and not only does it sound great — the best bit is that I secured it for a bargin-tastic US$16.10 (GBP £8.85) plus P&P from the USA. It arrived this morning. I excitedly set up my Brian May guitar / Vox amp combination and plugged in the Altoids treble booster, and did a quick and dirty A/B comparison between it and the treble booster built into the Vox Brian May ‘Deackie’ amp. I was delighted that it sounded great, although initially I was a little disappointed that the Altoids TB didn’t boost quite as much as the Vox … until I discovered the potentiometer hidden inside the Altoids tin and after giving it a little tweak with a screwdriver: perfect! Next, I added my BOSS NS-2 Noise Suppressor to the equation, which cut out the hiss from my amp — I have the Gain, Volume and Master Volume all turned up to 10! As well the neighbours know! I’m really looking forward to using it live now. But it has also fascinated me about how it works, and made me wonder: could I build my own? Now, where’s my Maplin catalogue? It just makes me want to build my own! Any chance of a circuit diagram? Hey that’s cool. I enjoyed reading it. I’m just getting bits together to have a go at building a Fuzz Face circuit, and maybe a Vox Tone Bender. Excellent! I hope you have great fun on your new project. I’d love to hear how it goes. Thats a great looking wee booster you have there! wow.. it’s so small!!.. ive recently built my own treble booster, to use in conjunction with my red special guitar and vox amp. i was also put off buy the price of those others. mine is built using a “brian may treble booster” circuit that i discovered, and it came to a total cost of under Â£20 !!! do you have a link to the Brian May Treble Booster circuit that you could share here? Was it this one on General Guitar Gadgets? What creativity! and to think it is hand-held? Now, this is pure power in guitar-shredding! I gotta have one of these. Now, I don’t have to run around ons stage and back again if I want a clean sound or a distorted one, right?Slash can now stop sweating profusely with it and instead of a cigarette in his mouth, maybe this should do fine….hehehehe….Wait a minute, maybe I can make my own TB thought-controlled like a MIG-31 or something like that and called it Firefox (oppss…) anyway, anyone here wants an affordable yet uniquely-designed personal checks? How about a personal check with a photo of your personal guitar or a picture of your favorite rock group? 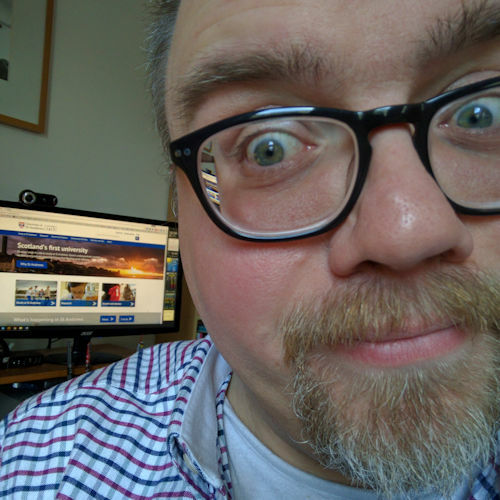 Click here … or up there….